Open House – 6:00 to 6:30 p.m.
Meeting – 6:30 to 9:00 p.m.
At its annual public meeting, the Texas Trustee Implementation Group will provide an update on the work we have accomplished since the historic settlement with BP. We'll also highlight a few of our ongoing restoration projects and talk about our plans for future efforts. In addition, you can attend a pre-meeting open house. The open house is meant to give you time to speak with agency staff who are responsible for planning and implementing restoration projects for the natural resources injured by the Deepwater Horizon oil spill. The meeting will open with a brief presentation about the basics of the Natural Resources Damage Assessment process, then we’ll describe future opportunities for public engagement in our restoration activities. Finally, we will present our progress and highlight a few of our projects already underway. We encourage you to attend and give us your feedback. All meeting presentations will be posted on our website after the meeting. If you need special assistance, please contact Nanciann Regalado at nanciann_regalado@fws.gov by October 5, 2018. The Texas TIG began this restoration planning effort by requesting project ideas from the public, governmental agencies, and stakeholders in June 2016. The Trustees considered more than 800 projects and proposed 13 preferred projects in the draft restoration plan published in May 2017. 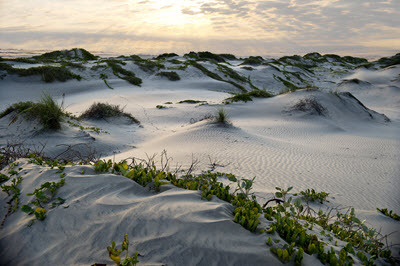 The draft restoration plan was made available for public review and comment, and public meetings were held in the Galveston and Corpus Christi areas in early June 2017. The comment period closed on June 19th. The final restoration plan reflects revisions to the draft plan resulting from public comments and continuing project development by the Texas TIG. In light of the recent impacts to the coast by Hurricane Harvey, the Trustees re-evaluated the proposed preferred project sites and determined that coastal conditions did not change the suite of projects selected in this restoration plan. In April 2016, a federal district court in New Orleans entered a consent decree resolving civil claims against BP arising from the April 20, 2010 Macondo well blowout and the massive oil spill that followed in the Gulf of Mexico. Under this settlement, BP agreed to pay the Trustees for Deepwater Horizon Natural Resource Damage Assessment up to $8.8 billion for restoration over 15 years to address natural resource injuries. This includes $238 million towards Texas restoration efforts. This is Texas’ first restoration plan utilizing these funds. For more information about ongoing restoration efforts in Texas or to view this restoration plan, please visit: www.gulfspillrestoration.noaa.gov/restoration-areas/texas. The Texas Trustee Implementation Group (TIG) is working to restore the Texas coast along the Gulf of Mexico after the Deepwater Horizon oil spill and is seeking public comment on the Deepwater Horizon Oil Spill Texas Trustee Implementation Group Draft 2017 Restoration Plan and Environmental Assessment: Restoration of Wetlands, Coastal, and Nearshore Habitats; and Oysters. The draft plan, published May 18, 2017, proposes a suite of restoration projects to compensate for injuries to natural resources caused by the Deepwater Horizon oil spill. The Texas TIG reviewed more than 800 restoration projects suggested by the public, state and federal agencies, and other various stakeholders. Of these projects, the Texas TIG proposes 13 preferred projects in the draft restoration plan and environmental assessment. 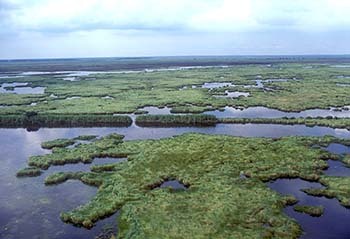 The natural resource damage assessment funds allocated to the Texas Restoration Area— with more than $175 million remaining in unallocated funds — are to be used to restore and conserve wetlands, coastal, and nearshore habitats, restore water quality through nutrient reduction, as well as replenish and protect sea turtles, birds, and oysters. For this draft plan, the Texas TIG prioritized restoration projects for wetlands, coastal, and nearshore habitats and oysters. the current and future availability of funds under the Deepwater Horizon natural resource damage assessment settlement. The draft plan is available for public review and comment through June 19, 2017. The plan will be available at public meetings in Galveston and Corpus Christi. All public meetings will begin with an interactive open house where the public can ask questions and learn details of proposed projects. The open house will be followed by a formal presentation and opportunity for the public to provide comments on the draft plan. A federal district court in New Orleans entered a consent decree resolving civil claims against BP arising from the April 20, 2010 Macondo well blowout and the massive oil spill that followed in the Gulf of Mexico. Under this settlement, BP has agreed to pay the Trustees for Deepwater Horizon Natural Resource Damage Assessment up to $8.8 billion for restoration over 15 years to address natural resource injuries. This includes $238 million for Texas restoration efforts, which includes approximately $49 million already received as part of early restoration. The chart and table below show the restoration funding allocated to the Texas Restoration Area for each restoration goal. Note that some restoration categories have been fully addressed in Early Restoration; the remaining restoration funds will be allocated over the next 15 years. For more information on the allocation of funds, please visit the Department of Justice Deepwater Horizon page (https://www.justice.gov/enrd/deepwater-horizon). The Trustees finalized the Programmatic Damage Assessment and Restoration Plan and Programmatic Environmental Impact Statement (PDARP/PEIS) in February 2016. The plan identifies the types of restoration needed to compensate the public for impacts to natural resources that resulted from the oil spill. The Plan identifies five goals intended to restore wildlife, habitat, water quality, and recreational activities in the Gulf. To achieve these goals, funds are allocated to 13 different restoration types. The restoration types address a broad range of impacts at both regional and local scales. The implementation of The Plan will restore wildlife and habitat and associated services such as recreational opportunities that were impacted by the spill. The Plan does not identify specific projects for each restoration type, but lays out a framework by which future project-specific restoration plans will be developed. The public will have the opportunity to comment on these subsequent restoration plans. 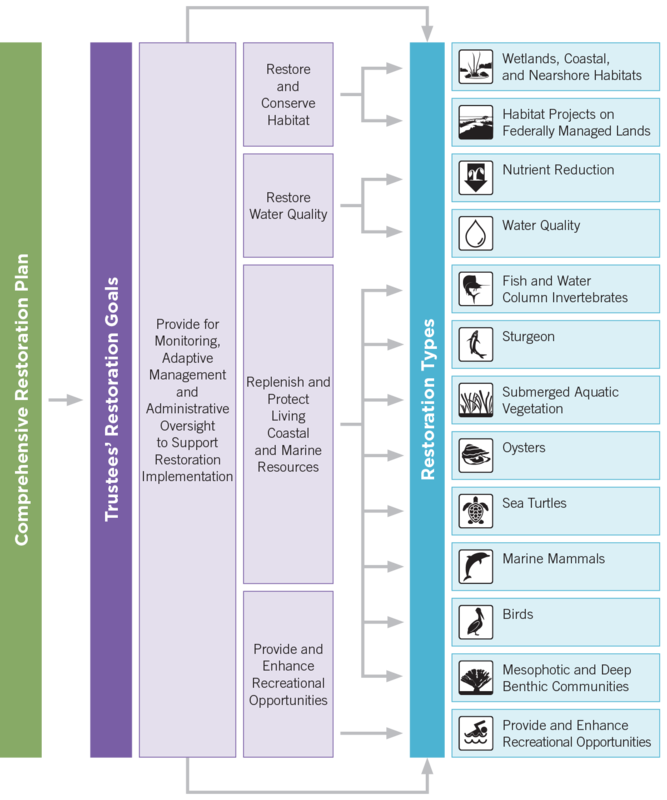 The figure below identifies the 5 restoration goals and 13 restoration types. To manage restoration activities identified as part of the settlement, a Trustee Implementation Group (TIG) was assigned for each of seven restoration areas (restoration in each of the five Gulf States, the Open Ocean, and Region-wide). The Texas TIG includes representatives of each state Natural Resource Trustee agency, including the Texas Parks and Wildlife Department (TPWD), the Texas Commission on Environmental Quality (TCEQ), and the Texas General Land Office (GLO) along with our federal partners, the U.S. Environmental Protection Agency (EPA), the U.S. Department of Agriculture (USDA), the National Oceanic and Atmospheric Administration (NOAA), and the U.S. Department of the Interior (DOI).